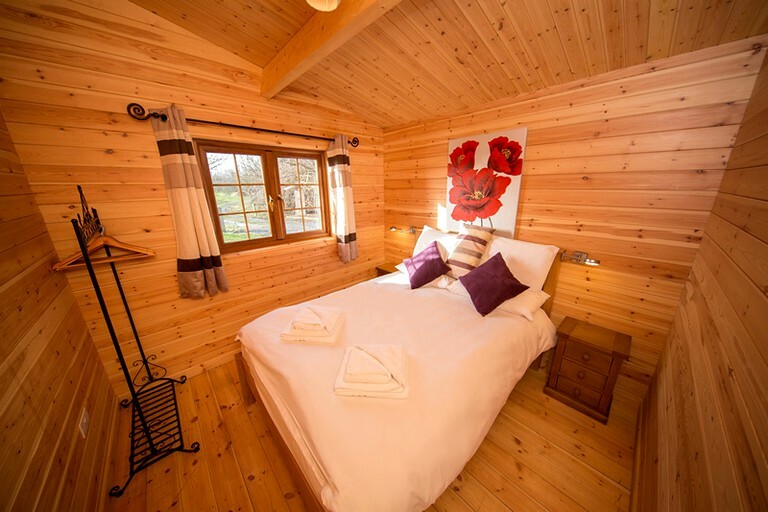 This romantic cabin camping rental in Somerset is modern, cozy, and sleeps up to four guests. There is one bedroom in the cabin which features a double bed, bedside cabinets, reading lights, and clothes rail. There is a sofa bed for the remaining guests. 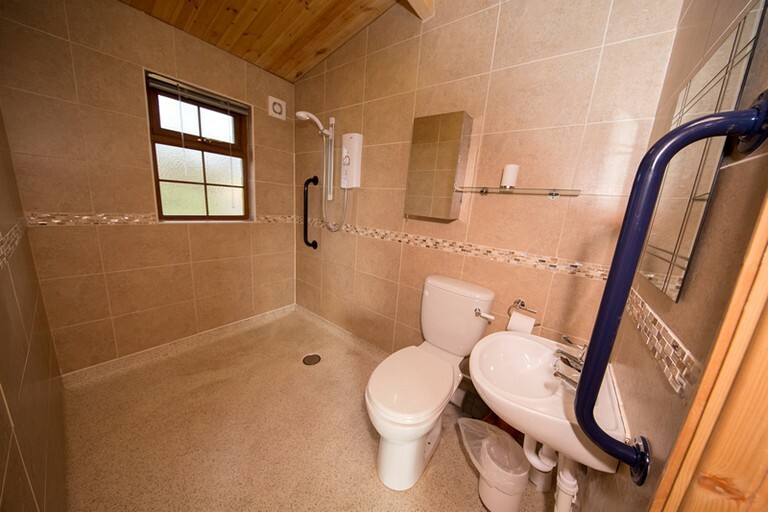 There is one shower room which comprises of a toilet, shower, wash basin, and hand rail. Also within the cabin rental, there is a newly fitted contemporary kitchen with integrated appliances including refrigerator with ice box, and an oven with grill and hobs. There is also a microwave, toaster, kettle, and a full range of utensils. 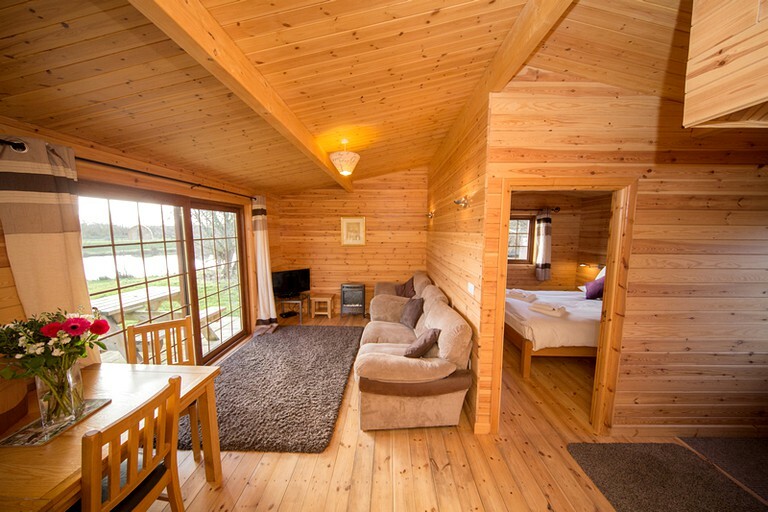 The cabin has an open plan living area with french sliding doors opening onto the patio area. It is furnished with 1x two seater sofa (sofa bed), an arm chair sofa, an oak coffee table, and a flat-screen television with DVD player. The dining area has a farmhouse style pine dining table and two chairs (additional chairs are available upon request). This glamping site has many facilities on site to ensure guests have an incredible glamping vacation. If it is a glorious day, guests have the opportunity to hire canoes and kayaks from the holiday farm. If it is raining, there are still many facilities for guests to take advantage of including a pool table, a hot tub, and a sauna. 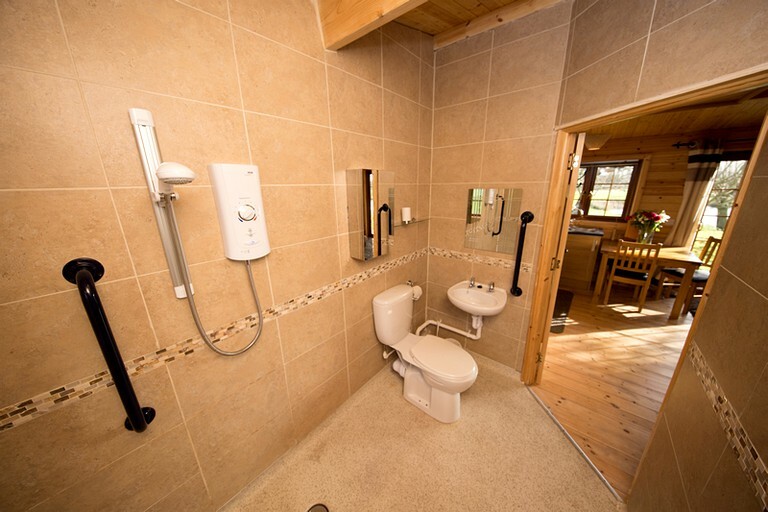 The sauna and hot tub facilities are ideal for friends and family to spend time together luxuriating. At the glamping property, there is also a small shop which offers meats, milk, cheese, bread, cereal, jams, chutneys, honey, and toiletries. If guests want anything in particular, please contact the host and they will be happy to help. 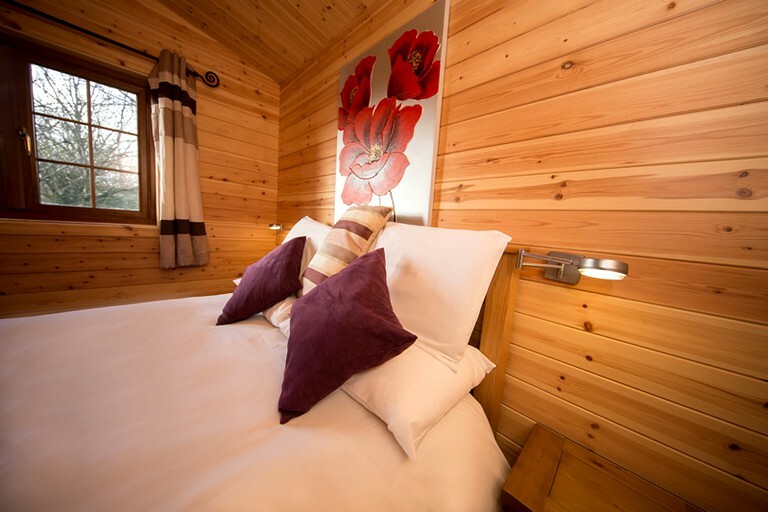 Outside, the cabins each offer guests an exclusive picnic area and a barbecue grill, while the pods give glampers their very own decking area and views of the glamping sites lovely pond. The site offers meat orders and guests can feel free to order a meat selection for their arrival. The host sources high-quality meat from a local butcher, who offers everything from sausages to steaks. Please give the host plenty of notice so that they can ensure everything is ready for the arrival. The host allows guests to organize supermarket deliveries to the farm. If guests would like to arrange a delivery please let the host know in advance and they can help with planning, and also ensure that the groceries are delivered to the correct accommodation. 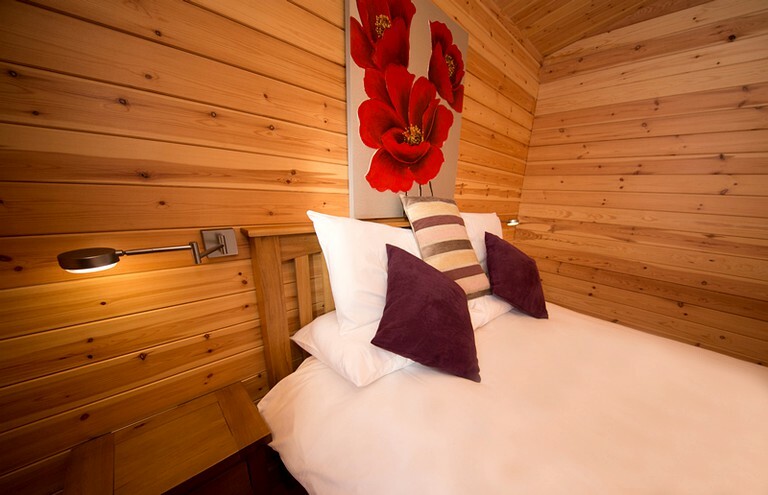 The sauna and hot tub facilities are available for a small extra charge of £6.00 per person for the duration of the guests stay. They are located next to reception and booked upon arrival. In the office, guests can book a time slot to suit them. Children under four years of age are not allowed in the hot tub. For those looking for an affordable and peaceful stay in the heart of Somerset—a great location to explore the southwest—this farm and glamping property is nestled within the countryside in East Huntspill, on the edge of the stunning Somerset Levels. This beautiful independent glamping farm has been in the family since 1927, diversifying in 2002 from being a dairy farm to a unique farm holiday setting, offering you a mix between luxury accommodation and the great outdoors! In addition, what makes us really unique is access to our range of fun outdoor pursuits and massage therapies as well as a real taste of Somerset living. There are an array of activities for guests to experience while staying at this glamping property. As well as the hot tub and sauna on site, there is also air rifle shooting available. This offers guests the chance to use high quality scoped air rifles at the range and learn the skills required for air rifle target shooting. Additionally, guests can enjoy the great sport of archery with professional archery instructors taking glampers through everything they need to know. Visitors can try air pistol shooting, where they will be using high quality 177 air pistols. Archaeology, metal detecting, cycle hire, fishing, and ax throwing are also on offer to guests while staying at this glamping site. Off-site, there are plenty of attractions to visit and enough activities available to ensure everyone is occupied while on their vacation. During the year, there are Bath and West annual shows, historical re-enactments, Glastonbury festival, and the medieval festival at Glastonbury. There are a number of circular and coastal walking trails in Somerset which lead through many picture postcard villages, making it the perfect reason to go walking. Guests could also go cycling across the stunning Somerset Levels, along quiet country roads exploring Wedmore and other small villages, while calling in at local pubs for lunch. Glampers can even cycle to the famous Glastonbury Abbey, Tor, and Chalice Wells Garden. For trips to the beach, guests can choose from over seven miles of sandy beaches that run between the coastal areas of Burnham-on-Sea, Berrow, and Brean Down. The host requires £100.00 per unit of accommodation as a non-refundable deposit. Before arrival, the hosts ask that the guest gives an estimated time of arrival. Check-in time is from 3.30pm to 5.30pm. If guests would like an earlier or later check-in please contact the host to arrange this prior to the day of arrival. If guests are planning on arriving after 5.30pm it is essential that they contact the host to let them know so that they can arrange a late check-in. Smoking in any of the accommodations or communal areas is prohibited by law and guests will be fined up to £1,000 for damage caused. Large groups may be asked to pay a security payment, this is refundable on departure.